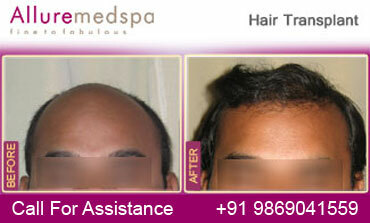 We understand that hair loss can be very traumatic. 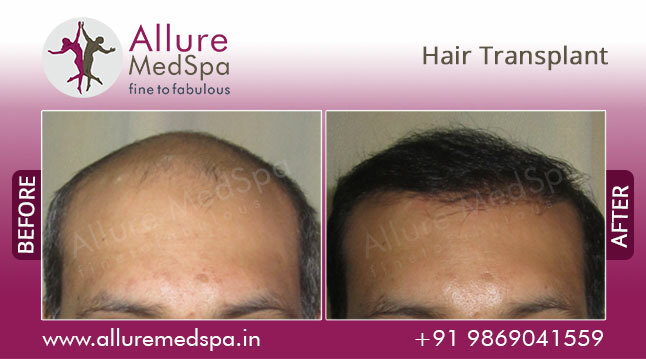 Baldness is often blamed on poor circulation to the scalp, vitamin deficiencies, dandruff, and even excessive hat-wearing. All of these theories have been disproved. 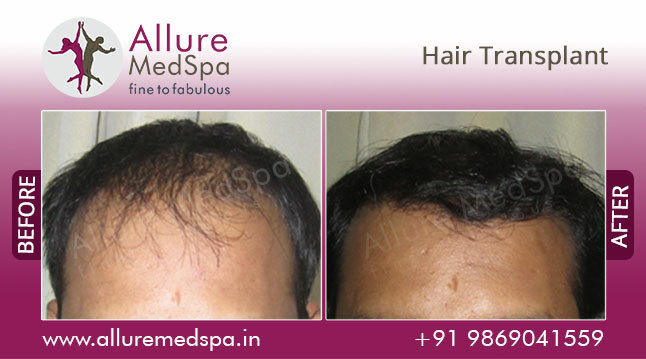 Hair transplantation is a surgical technique that moves hair follicles from a part of the body called the 'donor site' to a bald or balding or thinning part of the body known as the 'recipient site'. 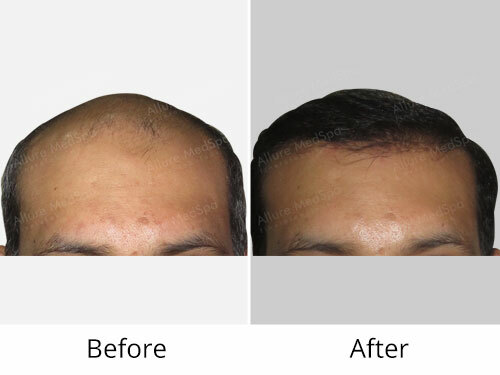 It is primarily used to treat male pattern baldness.However, it can also be adapted for facial hair like eyebrows, moustaches, beards and also chest hair although the procedure continues to be popular for head scalp hair mostly. In this minimally invasive procedure, grafts containing hair follicles that are genetically resistant to balding, (like the back of the head) are transplanted to the bald scalp. Ultra-Refined Follicular Unit Micro-Grafting– the new “Gold Standard”. In the hands of a highly skilled physician and staff the Ultra refined Follicular Unit Micro-Grafting procedure can achieve excellent new hair growth that is so natural that it is undetectable even under close scrutiny. Minimal trauma in the graft recipient area with rapid post-surgical healing. 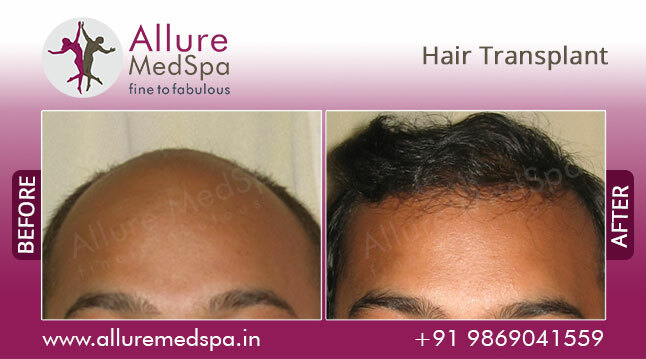 Allure MedSpa Hair Transplant Clinic is the premiere go-to clinic for a hair transplant in Mumbai. 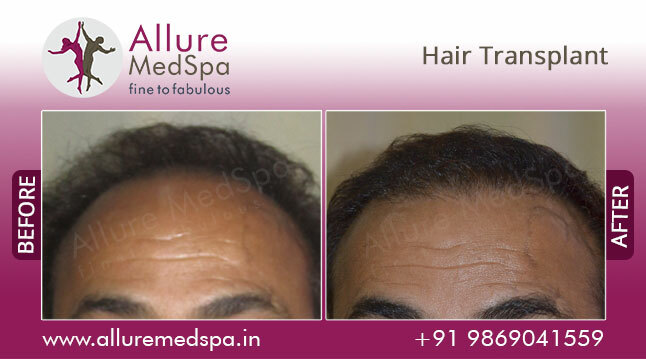 At Allure MedSpa we provide a natural looking and the best Follicular Unit Micro grafting (FUT) hair transplant services to clients who suffer from hair loss. 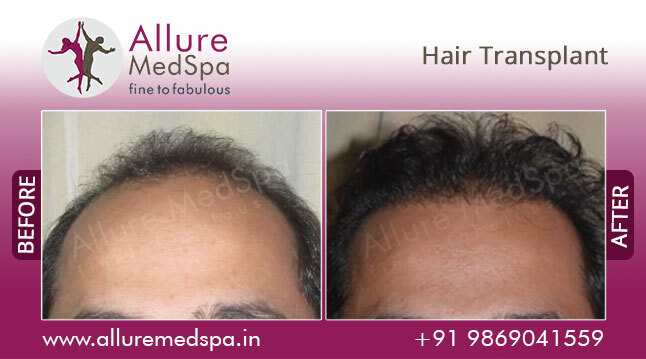 As a leading practice in the field of hair restoration and Follicular Unit Micro grafting (FUT) hair transplant, Allure MedSpa is the best choice for your hair restoration needs. 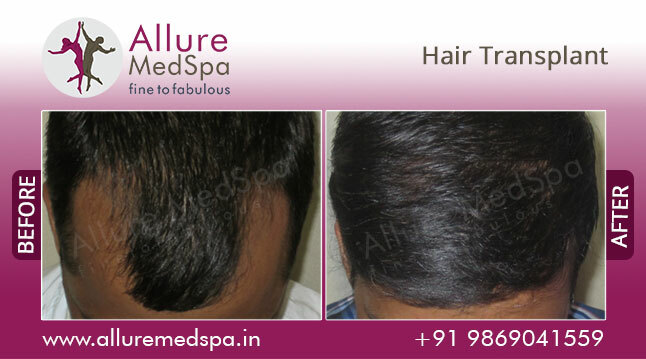 At Allure MedSpa Hair Clinic, we focus on both the artistic and scientific techniques. We work around the individual’s unique facial characteristics to ensure facial framing and design a natural hairline that compliments the individual’s facial features. 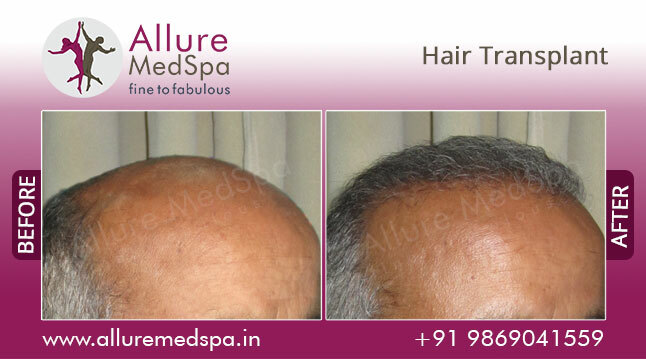 Allure MedSpa’s mission is to provide a natural looking hair transplant and hair restoration services to those who suffer from hair loss. 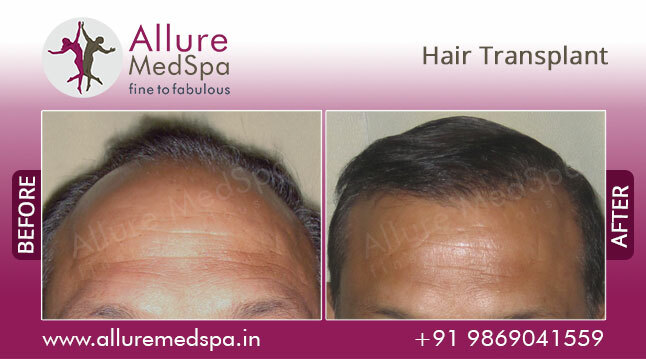 As a leading Follicular Unit Micro grafting (FUT) Hair Restoration Clinic and Hair Transplant in Mumbai, the surgeons at Allure MedSpa have had the great pleasure to work on some of the most recognizable celebrity faces. Our amazing patients come from across the globe to seek our services. 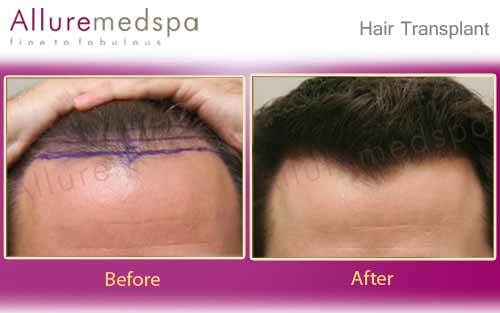 Hair replacement surgery, no matter what technique is used, is usually performed using a local anesthesia along with sedation to make you relaxed and comfortable. Your scalp will be insensitive to pain, but you may be aware of some tugging or pressure.General anesthesia may be used for more complex cases involving tissue expansion or flaps. If general anesthesia is used, you'll sleep through the procedure. How you feel after Hair Transplant surgery depends on the extent and complexity of the procedure. Any aching, excessive tightness, or throbbing can be controlled with pain medication prescribed by your physician. If bandages are used, they will usually be removed one day later. You may gently wash your hair within two days following surgery. Any stitches will be removed in a week to 10 days. Be sure to discuss the possibility of swelling, bruising, and drainage with your surgeon. After hair falls out, it will take another five to six weeks before hair growth resumes. You can expect about a half-inch of growth per month. You may need a surgical "touch-up" procedure to create more natural-looking results after your incisions have healed. 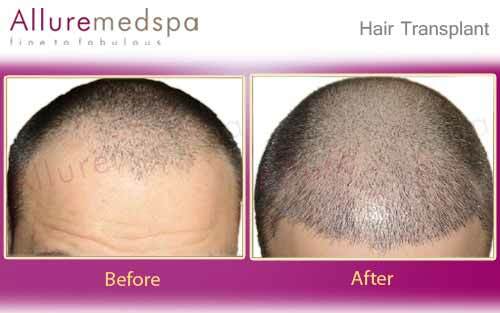 Sometimes, this involves blending, a filling-in of the hairline using a combination of mini-grafts, micro-grafts, or slit grafts. Allure MedSpa which is renowned for its state-of-the-art internationally acclaimed services,offers affordable and cost effective cosmetic procedures. 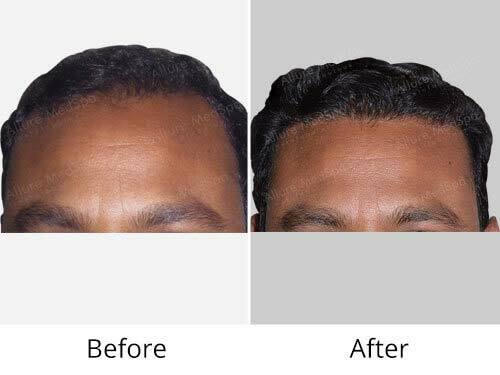 To know more about the Cost of Hair Transplant in Mumbai request a consult by filling the form below.Your consultation is your chance to ask questions about Hair Transplant and put your mind at rest. Your surgeon will be able to offer you full explanations and answers to all of your queries. One of the leader in hair services. Have undergone a Hair Transplant. I got natural results with natural density. 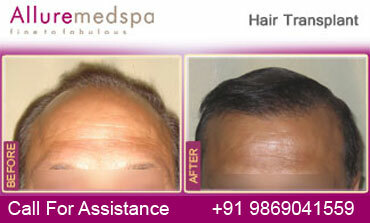 All skilled doctors & awesome Staff.\"
\"Done a hair transplant. I came from Surat. The staff was so polite & ready to help with every small thing that made the treatment VIP. 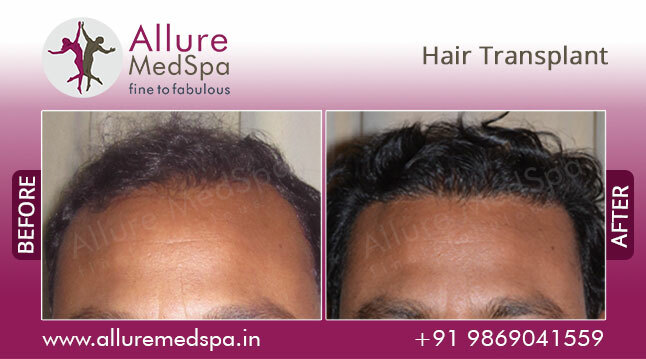 Dr. Milan during treatment follow precautions & gave me best output of the treatment. Results are there as expected.Thank You Dr. Milan And his whole Staff. , USA 4.0 4.0 2 2 One of the leader in hair services. Have undergone a Hair Transplant. I got natural results with natural density. 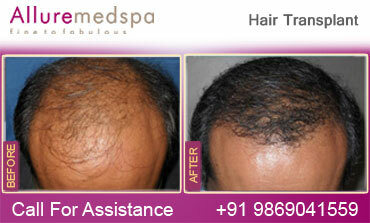 All skilled doctors & awesome Staff.\"
Hair replacement surgery can enhance your appearance and your self-confidence. Before you decide to have surgery, think carefully about your expectations and discuss them with your surgeon. The most important decision in restoring your hair is the physician you choose. The skill, talent, and experience of hair restoration physicians vary widely, as do the end results. At Allure MedSpa, we recognize that your needs extend beyond the surgical procedure itself. Our dedicated team of Doctors and Cosmetologists is designed with your comfort and care in mind. Our entire staff will ensure you are treated with utmost care and warmth. With today’s very refined micro hair transplant procedure, the incisions are very small and less invasive than past procedures. This results in more rapid healing. Most patients feel fine within a day or two following surgery, although some numbness and mild soreness can be expected for several days following surgery. If you are taking any blood thinners, please let the doctor know immediately, as they may represent a contra-indication to surgery. Do not cut your hair within two weeks of your procedure. Please leave your hair at least ½” in length in the back and on the sides to cover the sutures/staples after your procedure. If there is any question regarding length, it is better to leave your hair on the long side as we can trim it to the appropriate length the morning of surgery. Do not take any B or E vitamins for one week before your procedure this includes any multivitamins that contain these vitamins, as these will increase bleeding. They can be resumed three days following surgery. Do not take Aspirin or any other anti-inflammatory medications for one week prior to your procedure. These can be resumed three days after surgery. If you are unsure, ask the doctor. No Smoking: Smoking causes constriction of blood vessels and decreased blood flow to the scalp, predominantly due to its nicotine content. The carbon monoxide in smoke decreases the oxygen carrying capacity of the blood. These factors may contribute to poor wound healing after a hair transplant and can increase the chance of a wound infection and scarring. Smoking may also contribute to poor hair growth. A common recommendation is to abstain from one week prior to surgery until two weeks after the procedure. Do not drink any alcoholic beverages for at least three days prior to your procedure. For those who routinely dye their hair to hide “graying”, please dye your hair approximately three (3) days prior to your procedure. This will make white hair more visible. Be sure to scrub your scalp thoroughly each day prior to the surgery to be certain the scalp itself is free from dye. Shower the morning of your procedure and wash your hair very thoroughly using your regular shampoo. Do not apply sprays, gels, or any other styling products to your hair. If you wear a hair system, please remove it prior to shampooing and do not wear it before your procedure. You will be going home with a headband-type bandage covered by a bandana, so it will not be visible. The bandages should be removed just before showering the next morning. After the first shower, no more bandages are needed. A typical session of between 1,500 to 3,000 grafts normally involves a full day of surgery on an out-patient basis. Most patients will arrive in the morning and will have their procedure completed by late afternoon. Immediately following the surgery a patient’s recipient area is typically pink with scabs forming around the micro incisions. These hundreds of tiny incisions will heal rapidly within a week to ten days. 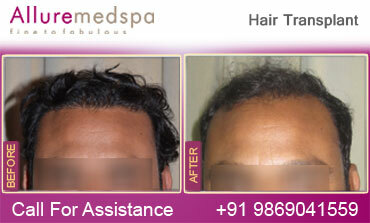 How much does a cost of Hair Transplant Mumbai? 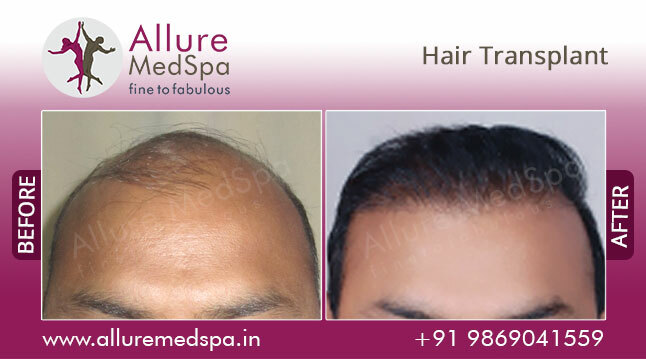 For an estimate on how much a cost of Hair Transplant Mumbai, we recommend that you Call Allure medspa on +91 98690 41559 for our latest Hair Transplant Prices. For specific information based on your individual needs, we will be happy to arrange a consultation.